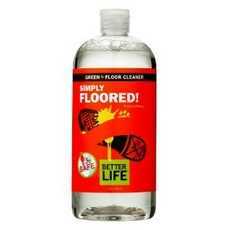 Enjoy Better Life Simply Floored Green Floor Cleaner. The Green Ready-To-Use Floor Cleaner That Loses The Dirt In A Couple Squirts. Spill Some Wine. Go ?Oops? With Your Soup. What?Ll Drop Most Is Your Jaw, Because Simply Floored! Will Do A Shiny Number On Tile, Wood, Stone, Laminate, Linoleum And Even Cement. It?S A Cleaner, Not A Wax, So No Worries About Waxy Build-Up On Your Floor (Or Feet, For That Matter). (Note: Description is informational only. Please refer to ingredients label on product prior to use and address any health questions to your Health Professional prior to use.